There’s a secret ingredient to Pilates. Ready? It’s called OPPOSITIONAL ENERGY. I’ve also heard it called THE TWO WAY STRETCH. It’s transformed my practice and I hope it will bring something wonderful to yours. It’s really simple. Imagine an elastic band. You have to pull in two directions to get length. 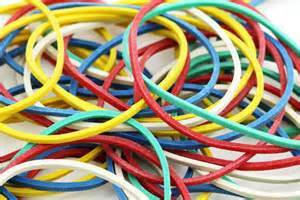 Imagine pulling on only one side of an elastic band. That would be weird. Now imagine pulling it in two directions. Wow. The length is astounding. Imagine pulling a mound of dough in two directions. Wow again. A caramel. Wow. Gum? Are you seeing a trend here? The two way stretch or pull yields a lot of length. Now apply that same idea to your own body. We’ll use the core as an example. When you hunker down and contract your core 10/10, it’s easy to look shorter, thicker, and paunchier. Try elongating your core with the engagement. Lengthen your center in two directions. Lengthen your spine – up through the crown of your head and down through your sacrum and toes. How much space can you get between your hips and your ribs? Hey you look amazing! Long and lean with beautiful posture. Lengthening not only looks good – it’s feels amazing.